2011 nears its end, with 2012 to follow. Many the movie, novel, web comic and television series about the undead await us in the future–and if they deal with vampires let us offer a few gentle reminders. Past tellers have sometimes done marvelous examples of how to deal with the undead, examples that too often end up ignored. Vampires need weaknesses. Otherwise, they’d taken over the world long ago. “Blood Ties” for example portrayed vampires with a territorial instinct that kept them from working together–they actually had to exert willpower not to kill one another in the same city. Likewise damage from sunlight (made-up by show business but handy) or extreme allergies be they to wolfsbane, garlic or vervain serve the same purpose. Killing a vampire should be difficult, but hardly impossible. Yes, this is one of the primary flaws in the world of “Twilight,” although it is in keeping with the ideas Stephenie Meyer wanted to explore. Still, one wonders why the Volturi haven’t simply taken over. Cheap guilt means nothing. A pervasive trope in vampire fiction for the past few decades–quite understandably–has been the Reluctant or Guilty Vampire. It combines the horror of assault, parasitism, living death, etc. with the normal emotional reaction of a human being finding himself in that situation. Hence, conflict, the heart and core of drama! Sometimes this plays out brilliantly–as in Louis’ melancholy fatalism in “Interview With the Vampire,” or the desperate loneliness of a child in “Let Me In,” or the difficult personal quest for redemption in “Forever Knight” and “Angel.” But this presupposes genuine, justified guilt. In “Moonlight” we see a vampire detective wracked with horror and guilt–this coming from someone who needs never kill, hasn’t killed, can get blood from enthusiastic donors–in fact, the vampires in that show don’t seem much like monsters at all. So Mick St. John seems…well…foolish. His guilt certainly never makes much emotional sense or impact. Likewise Edward Cullen may have some real horror in his past (when he decided to go kill murdering humans for a few years) but not enough is made of it in the story to justify his moodiness (granted, that remains a matter of nuance). Compare this to Barnabas Collins, whose vampire nature ended up killing his fiancee and nearly every single relative he had! Vampires are monsters. Okay, I enjoy a good romance as much as the next person (not as much as some, but more than others). 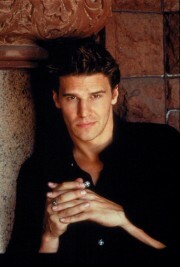 I totally get the idea that vampires might well be extremely attractive to their prey. But one can easily go too far in that direction. One of the most powerful scenes in “Buffy” (which, let us face it, achieved hallmark status in this genre, really) was when Angel tried to turn his vamped-out face from Buffy, and she kisses him, saying she hadn’t even noticed. 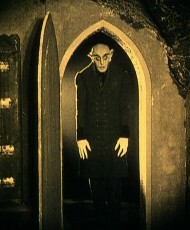 Now, the nosferatu in that show were ugly–snaggle-toothed, animalistic, distinctly demonic. Visually, that always served as a reminder of the horror of what they are. Without some hint of the genuinely evil, a vampire romance almost inevitably turns into syrup. To pursue the food metaphor for a moment, syrup cannot be a meal because it remains a mere condiment. You need something more, at least to have a good meal. A real challenge of course would be to make a vampire utterly horrible–like Graf Orlock in the film “Nosferatu” or the creatures in “30 Days of Night”–and still show someone as falling in love with them. Go rent “Let The Right One In” to see how that might work. I’d also make a plea on behalf of all vampire nerds everywhere that storytellers come up with some rules and stick to them. Better still if the vampire rules make some kind of sense. Killing one person a night, for example, pretty much means it is impossible to hide the existence of vampires–unless their numbers are very small indeed. Likewise if a single bite transforms, how come we aren’t up to our eyebrows in vampires? Sunlight–does it harm or not, and how much? Do vampires have reflections? Back in the day, much was made of the fact they did not on the t.v. show “Dark Shadows,” except of course when the cinematographer found a cool way to use those reflections! And in the Badham film of “Dracula’ starring Frank Langella, I’m still baffled why the vampire girl cast no reflection in the mirror but did reflect in a pool of water! But, then, I am a vampire nerd. And proud of it! Maybe it’s just me – and maybe I’m weird – but I thought that the scene in Priest of the Queen feeding Black Hat her blood was very tender, perhaps even romantic. And he did speak about her in a reverential, almost loving, way. Wonderful post and one I’ve just put into my research file for Vampire Origins. These are all ideas I am trying very hard to incorporate as I create my vampire universe. Likewise if a single bite transforms, how come we aren’t up to our eyebrows in vampires? As this LiveScience article suggests, if transformation from normal human to vampire occurred strictly from a bite, Earth would be populated entirely by vampires in just a few years. Some traditional tales solve this mathematical quandary by requiring the normal human to drink vampire blood to effect the transformation. A- paranoia, reluctance to share territory and jealousy of status (every vampire wants to be the top dog [or wolf or bat]) all conspire to keep them from forming true alliances capable of lasting. The typical Vampire would feel safer surrounded by several individually weaker underlings than another vampire on his level. B- Shortsightedness. Vampires underhandedly encouraged humans to multiply as much as possible to gain unlimited feeding stock. Now humans outnumber them by thousands (if not millions) to one, and should all humans realize the myths are true- imagine army ants swarming over a scorpion. Even the strongest vampire dies if ripped apart or torched by a mob. 2) I focus more on adults, at the same time remembering not all adults are pretty as well. 3 & 4) These kind of overlap. A vampire may feel gulit over killing at first, maybe even for a long time, but the one who lasts accepts that the human he used to be is long dead, and that what he is now will only survive at the expense of humans, like it or not. Any one who attempts a loving relationship with a human is setting both of them up for needless pain. As for rules on how vampirism works, here’s one example- He may not have to feed every night or even drain someone dry in one feeding, but people remember being bitten and will have the marks to prove it; to throw off the lynch mobs the vampire likely has no other option BUT to kill his victim and dispose of the evidence creatively. OK, I think I’ve gotten the ranting out of my system now.